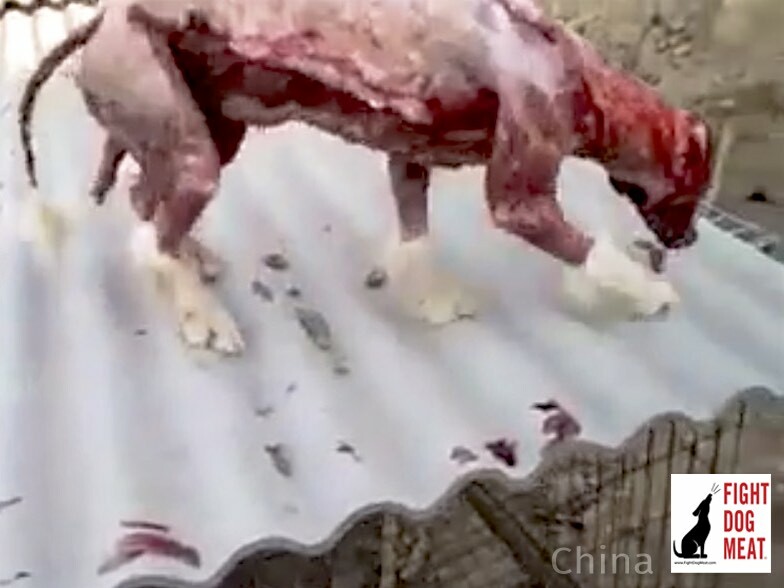 According to reports, this dog was skinned alive by it’s owner for it’s fur pelt in Dongguan, Guangdong. In parts of China dog skin pelts are seen as luxury items, as throw-rugs on the floor, car seat covers and mattress toppers. For dog skin throw-rugs, the head is attached to help identify the breed of dog. Very small dogs are sometimes turned into ladies clutch purses, with the toy-breed dog’s head as the clasp. 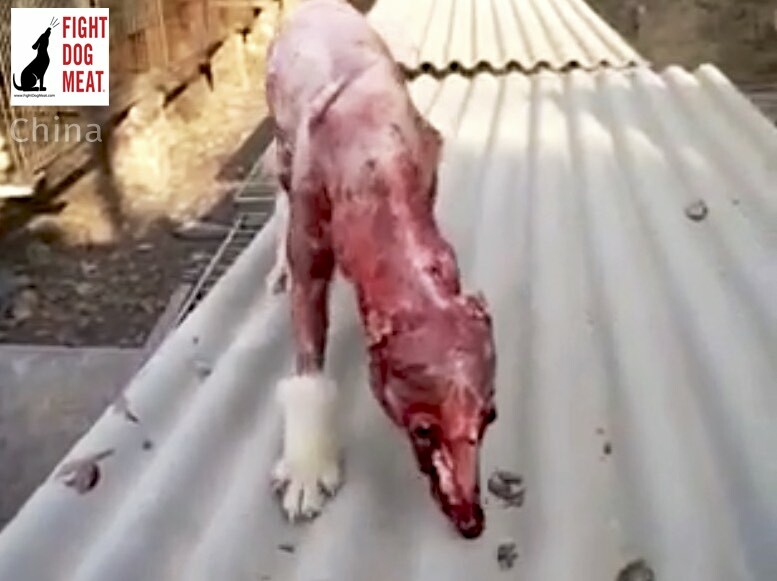 This dog’s pelt was reportedly hung from a verandah and the dog was left like this. Apart from posts of shock and horror, I do not have further solid information. This is ‘not’ a hoax because there is a video attached below. The dog in this article is still alive because neither it’s vital arteries or wind pipe have been severed. Similarly, the dog’s internal organs have not been pierced or exposed. There was a similar incident a few months ago involving a another Samoyed dog. That dog had been skinned over the greater portion of it’s body. The dog escaped it’s tormentors and was seen wandering down a road. 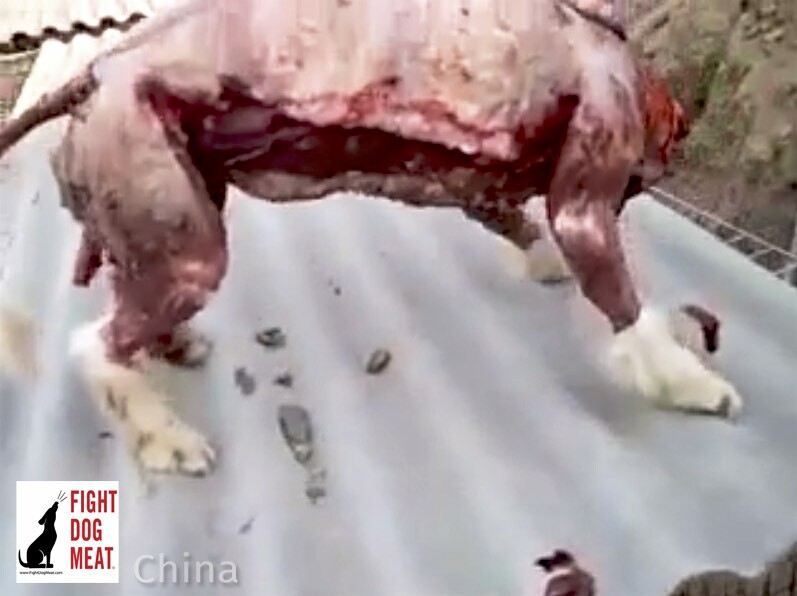 As animal rescuers approached the dog they could clearly see it’s intestines hanging out. That dog did not survive. It is unfathomable to begin to comprehend the blinding agony this dog must be in. It’s so horrific that its painful for our mind to even consider. Shockingly, this is not illegal because China does not have animal protection laws. Fight Dog Meat is fighting to help local animal lovers and rescuers who LIVE in dog meat countries, to have their voice heard by their own governments, with the goal of implementing animal protection laws and ending the dog and cat meat trade. Saturday 20 May, 2017 we are holding a world wide event for exactly the reasons stated in the last paragraph. Please mark your calendar and join us in over 28+ countries! Email me for more information: Contact@FightDogmeat.com. Stop this evil cruelty!!!!!! You sick people!!!! beyond shocking…horrifying that these “people” see nothing wrong with inflicting such abject cruelty that is barbaric to an extreme: to think that this type of horror occurs constantly is mind-numbing. I pray, I sign, I protest, I scream. This has to STOP. This barbaric, no one is allowed on this earth to do this. The world is watching you… You will all pay for this , NOT ACCEPTABLE YOU ARE MURDERS OF DEFENDSLESS ANIMALS. You are discusting!you are a psychopath with your people that are psychopaths too.